Nationally syndicated radio talk show host and columnist Kevin McCullough tackles the thorny issue of why the audacity of hope is not found in the current path that President Barack Obama has laid. As the first pundit in the world to predict that President Barack Obama would become president of the United States (verified on-air by Rush Limbaugh), Kevin McCullough was not surprised when Mr. Obama was elected to that office. Yet even McCullough admits he’s surprised by President Obama’s actions since the election. Surprised by the overt falsehoods already carried out by this administration. Surprised by our country’s sudden deficit of clarity and common sense. Surprised by a blatant lack of accountability. In No He Can’t, McCullough stands as the loyal but outraged loyal opposition to the current state of affairs. I don't think I picked up this book in the first place because I want to know anything bad about Obama. Either way, I picked up this book because I thought it would be very interesting to know about one of the biggest influenced person in the world. Reading the book, I caught that McCullough is not a fan of Obama, he's stating a lot of what Obama had promised are not and will not coming. Since I don't really know a lot of what is going on in US so, I guess the author gave quite bad impression of Obama. I'm not really interested to know about the political views of this but the book is actually tell us what is going on if not more, a little about what is happening in the country under Obama. I found the book very interesting, even though you are not very knowledgeable about politics. 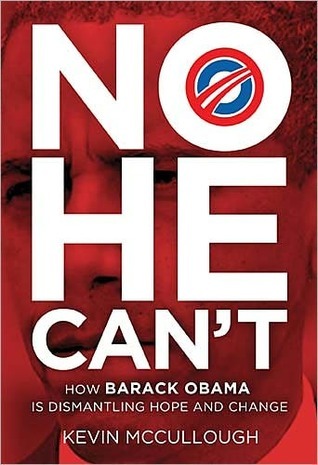 But here's the thing, I don't think I'll judge Obama base on the book, yes, the book gave great insights about him but, we can't really trust it 100%. This is my opinion about it. Maybe if you are American, then you'll know the difference of what is right or wrong. I thought the book will be good to anyone who has great interest in politics in US. Disclaimer: I received this book free from Thomas Nelson Publishers as part of their BookSneeze.com book review bloggers program. These are my honest review and receiving a copy in no way will ever reflected my review. The title grabbed me when I saw your review as well and I am not all that into politics or as knowledgable as I could be. I believe like you do that the book is probably more his opinion then fact...it's always so hard to tell now days. I'm totally not into politics and trying to stray away from anything that link to it. So I truly admire you that you managed to finish this book! Great honest review! I admire you for reading something like this! Hello Darlyn, I'm dropping by from Cym Lowell's party and I'm a first time visitor. Like Juju I admire you for reading this because I probably would not have, though it's good you have an open mind and think for yourself. If a pundit wrote it, there's automatically a hugely slanted, blatantly biased agenda, which tends to target someone on the opposite end of the political spectrum. By the sounds of it, this is one more example of a guy preaching to the converted, a la Beck, Coulter, Moore, and Franken. I've sworn off that kind of dreck.